This observation is regarding a limited time offer on my local daily newspaper subscription and an e-news article reporting of a nationally (U.S.) known paper downsizing its print edition along with the community’s response. These two observations are relevant to the transition occurring in the print media culture and the future of my coupon collection. They acknowledge present day social economics within each community and their role in the transition process. Recently, on the front-page section of my local Sunday paper was an advertising sticker promoting a limited time offer for half off subscriptions to receive full access to the daily e-Newspaper and home delivery of the print edition. Then about a week later, I receive a postal mail version for the limited time offer. This letter outlined the three offers. The only difference in the three offers is the print edition delivery of the newspaper and all three include the full access to the online e-Newspaper and applications for tablets, mobile sites, and smartphones. The three options in the print editions are full week delivery (Monday – Sunday), four-day delivery (Thursday – Sunday), and Sunday only. At the end of the Ad Circular Observation (March 7, 2012) blog post I wrote about the detail of the two subscriptions that were $15.00 for the e-Newspaper or combination of e-News and printed edition newspaper. Now three months later my local newspaper is promoting limited time (6 months) at a special rate to receive a printed edition newspaper after increasing the newsstand rate by half and the promotion of the e-Newspaper. A recent National Public Radio (NPR) e-news article describes an opposite plan for the New Orleans, Louisiana Times-Picayune newspaper. The Times-Picayune is cutting its print edition newspaper to three days a week with no other print delivery options. The restructuring by Advance Publications, a Newhouse Company, has laid off journalists and other employees with the plans of moving towards the majority of online service. My local newspaper has had lay offs and retiree buy outs recently, but they are not making a bold move of limiting the printed edition of the paper. The limited time offer my local paper is offering tends to imply they are either loosing paper sales/ subscriptions with the recent rate of the print edition increase or are grappling with the transition of moving away from the printed edition. The NPR article states in the beginning there was a public rally in New Orleans to preserve the daily publication after the announcement of the cuts to the print editions. Besides the article mentioning the standard ideal of the newspaper being part of some of the population’s morning ritual, it highlights the accessibility to the New Orleans community of the tangible (print edition) and intangible (internet access) of the local news. Demographics are a common role and widely known contributor to one type or the other of accessibility of the local news. A quote in the NPR article from a former city councilman and state senator acknowledge that a third of the New Orleans residents (lower income and older citizens) do not have internet access and this raises concerns with their attainment to daily local news. This concern is also acknowledged in an NPR interview with Times-Picayune reporter, Mark Schleifstein, he states an important “unknown” about this transition of the print media culture. It is questioning how to keep an audience with these new products (internet base). His opinion of these new products is that in the newsroom they are still in the process of getting a handle on them. There is a need to understand how to get the daily news to the digital divide within the New Orleans population. In the end of the interview he mentions the other financial contributor of a newspaper, which is the advertisers. The shift in cutting the print edition can effect keeping the advertisers happy with the new products that are offered from the news corporation. I refer to the section, Coupon within Print Media Culture, of my Print Media Coupon as Artifact essay that demonstrates the modes of communication in the transition of print media culture. In the essay, I refer to a 2008 MSN Money article that states about 75% of coupons that are issued are in the Sunday newspaper. The grocery and drug companies have no plans to stop printed-paper coupons until the majority of consumers further the use of e-coupons. This reference relates back to Schleifstein’s comment on the advertisers and the use of new products. If the public hasn’t made the shift from tangible to intangible products, because of lack of resources and economic means the transition could need a longer time period for it to occur or remain as a divide. Since I am observing the Times-Picayune transition by means of following media reports and not by physically being in the community, I will need to broaden my news articles beyond my NPR access. The Times-Picayune transition is a good observation, since this is an active move with their cut backs on the print edition newspaper than my local paper is. These plans are for the fall of 2012 and the implication of New Orleans community voicing the need for a tangible print object in their community could determine the effect on the future of print media culture for that community. With no rallies in my community, my local newspaper’s limited time offer tends to have a perspective of a news corporation seeking an audience for either type of product (tangible or intangible). 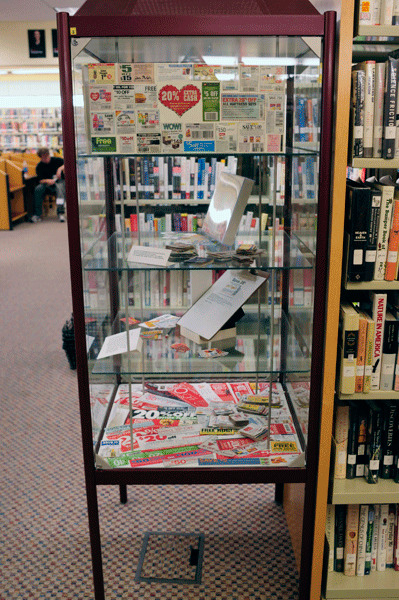 The restaging of the collection’s artifactual object, The Coupon Collection, is at the Newark Free Library public display case. Friends of the Newark Free Library in Newark, Delaware offer display cases to exhibit member or public organization’s interest, artifacts, or even a collection. These cases are meant to be used as a venue for the community and to enrich the library community. The cases are on a rotating exhibit schedule and the Friends of the Newark Library committee review proposals for the exhibits in the display cases. My proposal was to exhibit a segment of the Coupon Collection as well as a summary of the statement for this collection. QR codes would accompany the statement and provide a visual of the alternating state between tangible (print media form) or intangible (stored digitally in an electronic device). Upon my proposal being accepted and preparing for the display, I realized other aspects of the collecting process needed to be presented. The archiving and management practice needed to be included. This not only supports the statement, but the concept of the collection process that is still in progress. The archiving information card for June 2012 expiration month is presented with some of the June coupons. This area of the display has it’s own signage acknowledging the use of the card and the ending tally for the month of June on the date of May 31, 2012. Since there is still a month’s time left for collecting June coupons, the public is given the information of the website address to have the option to continue to follow the Coupon Collection recent additions. The opportunity to restage at a public institution offers the options to view the collection in person and if the individual chooses to continue to view the collection via the internet. To view more images of the Newark Free Library restaging of the Coupon Collection please visit the website. Several social media options are available on the front page of the website to stay updated on the recent additions of the collections and public access to the collections via the internet. If summer travels are in the proximity of Newark, Delaware USA - please inquire about the library’s hours and location. The Coupon Collection will be on view from June 4 – August 17, 2012.